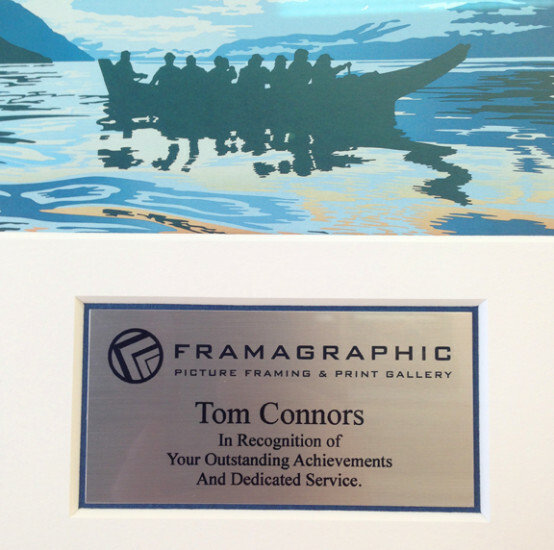 Our customers often ask us about making recognition plates to go with their artwork. 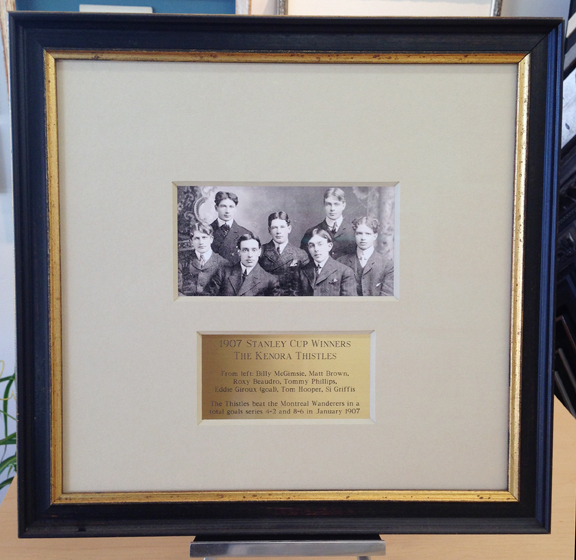 Recognition plates are often referred to as brass plaques but the technical term is a plate. And they are not always brass coloured. A recognition plate is a great way to acknowledge someone’s achievements at work or in sports, for example. We have had plates made up to recognize someone’s contribution to a board of directors, for example, or to go with a photo, a ribbon and a bib after someone runs a marathon or wins a dragon boat race. Recognition plates are also commonly used when we frame war medals or other mementos like baby shoes or a sports jersey. This is an engraved brass-coloured plate we had made as an example for our shop’s sample wall. 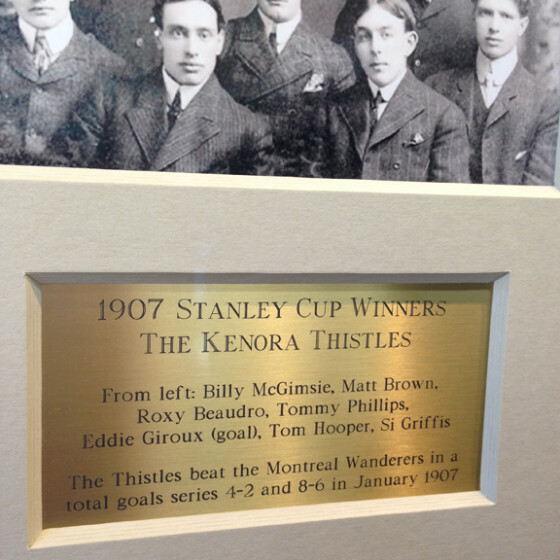 A brass-coloured plate with engraved lettering outlining the names of the Kenora Thistles hockey team that won the Stanley Cup way back in 1907. 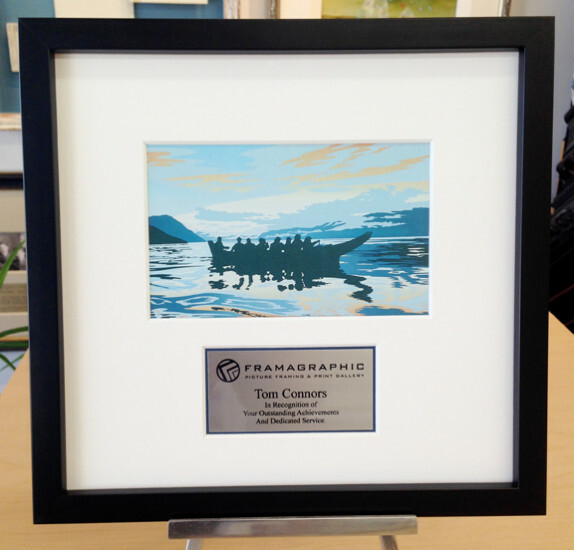 Here is an example we made for our display wall in the shop: we used a card with an image of a big canoe team by artist Roy Henry Vickers and added a silver coloured plate below it to recognize the efforts of an employee. The canoe symbolizes teamwork and “pulling together.” Get it? In this case we used our own corporate logo along with some text. This plate is silver-coloured with black lettering printed in a process called sublimation. In this case we left a sliver of space between the plate and the white mat to show the blue mat underneath for a touch of added colour. We don’t actually make these plates ourselves but we work with a company that specializes in this sort of thing. If you send us the text in an email, we can take it from there and arrange to have your plate plaque made up to suit the piece. Plates can be brass, gold, silver or black coloured in both shiny and matte finishes. And, yes, we can incorporate your company’s logo into the plate, if you’d like. And they can even do some things in colour.